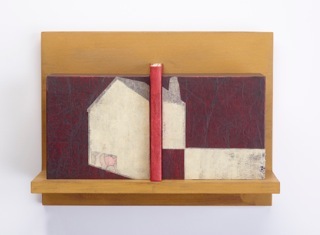 Our fortieth exhibit, curated by Lisa Blackburn (Burnsville, NC), presented an unusual look at the art of books. Blackburn sought artists whose work exemplified the qualities of great bookmaking, and this exhibit was an intimate and special look into a wide range of this lovely art form by seven unique artists. Andrew Hayes and Margaret Couch Cogswell use books to create sculpture – one abstract, the other whimsical. Sanibel artist Martha Graham alters books to invite us into her world of nature. The accordion book is a format that presents a story beautifully, and in this exhibit, Lynne Avadenka and Laura Ladendorf have created books that unfold. Both Jessica White and Lisa Blackburn combine the literary with the visual; but Blackburn’s book hangs on the wall in its own bookshelf, whereas White’s book is set in a theater with the characters and story scrolling across a stage – a silent movie of sorts. Andy Farkas creates a more traditional book – the entire book; he writes and illustrates the story, block prints the pages, makes the covers and hand-binds them into children's books to be handed down. It is not only the beauty of these books that is so captivating, it is the stories they contain; stories about the old West, diversity and differences, animal as teachers – stories that pull at our hearts, make us laugh and make us think. Each book in the exhibition presents not only its own story, but a story about the mind and heart of the bookmaker. At this time, when books are on everything but paper, it is wonderful to hold a handmade book and touch the paper. These are books to reread, cherish and hand down.